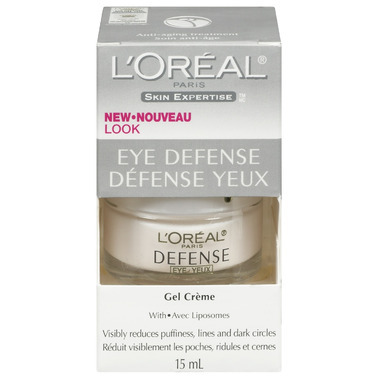 L'Oreal Skin Expertise Eye Defense Gel Creme visibly reduces puffiness, lines and dark circles around your eyes. With liposomes, this unique gel creme penetrates the skin's surface to deliver hydrating and nurturing ingredients. I've been using this for nearly a month now and it works as well if not better than the more expensive eye creams. I have really enjoyed using this product; it goes on light and seems to last the day well. Compared to other eye creams, this one is almost like a clear watery jell; but seems .. well the word is more mild and pure. I would very much recommend it; the pricing seem of very high value too.